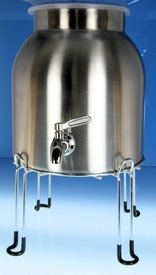 We have taken this beautiful stainless crock, added a matching stainless steel spigot, and put it on an attractive counter top stainless steel stand, just add your own bottle filled with water and away you go. Sturdy Stainless steel stand, the 4 legs are coated to prevent marring sliding. Bottles available separately or supply your own.